Today, it’s all about tzimmes. Lovely, colorful, sweet, yummy tzimmes. So, just what the heck is a tzimmes? 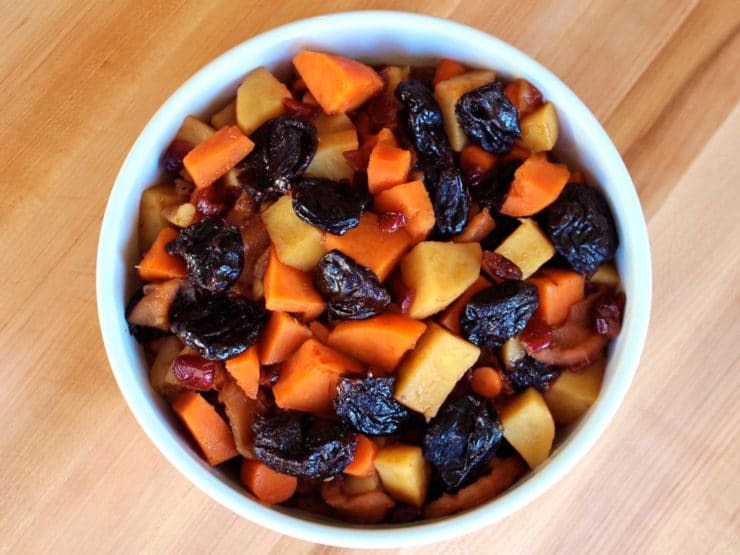 Tzimmes is a traditional Ashkenazi Jewish stew made with sweet root vegetables– carrots, sweet potatoes, yams– and dried fruits like raisins or dried plums. The word tzimmes is also a Yiddish expression for “making a fuss” over something. Not surprisingly, tzimmes is a bit of a fussy dish… with all of those root veggies, there is lots of peeling, chopping, then more peeling and more chopping. The side dish is often served for Rosh Hashanah, where sweet foods are served to signify our hope for a sweet new year. Carrots are chopped into circles, which are reminiscent of coins, symbolizing prosperity. Sometimes tzimmes are served with meat, like chunks of flanken or short ribs, in a luscious sort of savory/sweet stew. Most often, they’re served as a side dish to accompany the holiday meal. But here’s the most important question about tzimmes… how the heck do you pronounce it?? If your kitchen is anything like mine during the holidays, oven space is precious. With brisket and chicken in the oven, kugel warming, and challah rolls baking, I try to find ways to cook my side dishes on the stovetop. Hence the name of this recipe – Stovetop Tzimmes! To make this dish pareve or vegetarian/vegan, use lightly salted water instead of chicken broth to cook the ingredients. I like using chicken broth because it adds a savory element to this naturally sweet dish, giving it a nice balance of flavors. This dish is gluten free and kosher for Passover (if you use KFP certified broth/ingredients). Enjoy! Make traditional Jewish tzimmes for Rosh Hashanah, Passover, or any festive occasion. Yams, sweet potatoes and more. Kosher, Meat or Pareve. 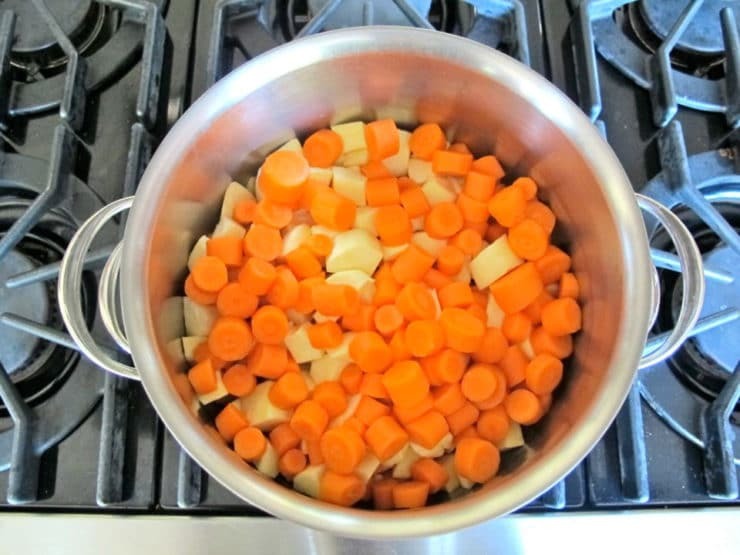 Place cut yams, sweet potatoes, and carrots on the bottom of a large heavy pot. Pour dried apples and cranberries on top. 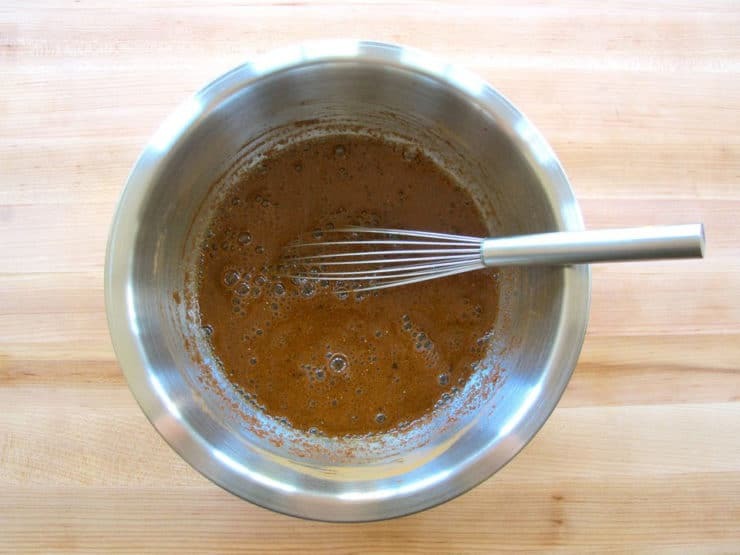 In a medium bowl, whisk together orange juice, honey, brown sugar, cinnamon, salt, and black pepper. Pour mixture over the fruits and vegetables in the pot. Add chicken broth or salted water to the pot, covering the vegetables halfway. Heat pot over medium high till it begins to simmer. Stir the ingredients once gently. Reduce heat to a gentle but constant simmer. Cover the pot. After 45 minutes, open the pot and gently stir again. 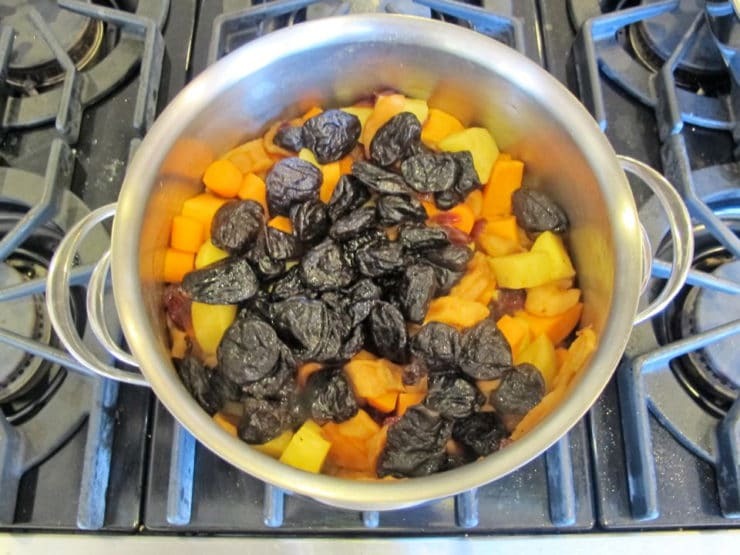 Place pitted prunes on top of the simmering ingredients. Cover pot. Continue to cook on lowest heat for another 15 minutes, until potato pieces are tender and prunes have warmed and softened. Don't cook too long, or the prunes will dissolve-- it will make a nice sauce for the tzimmes, but it won't look so pretty on the table. Serve warm as a side dish to a festive holiday meal. A dumb thing, but: the bowl you mix the sauce in should be big enough to hold at least 6 cups of fluid. 8 would not be an error. Also: the store ran out of dried plums; I could only get 3/4 cup. I substituted figs for the other half, and it turned out just fine. This recipe is very tolerant of people like me who don’t know what they’re doing. Also: this is a stove-top recipe, as opposed to an oven-bake recipe: very helpful for holidays when a turkey might be tying up the oven for many hours. Would you suggest tart or sweet apples? I’m going to dehydrate my own so I can pick any variety. Thanks! Would leaving the apples out really change the flavor? can’t find them anywhere. No it will still be good. 🙂 If you want you can substitute dried apricots. Do you have a tzimmes recipe for baked tsimmis? Not too sweet? Most tzimmes are on the sweet side. I am considering a roasted tzimmes recipe this season, if I have time I will post it! I’ve made this so many times with variations in the recipe due to what I have in the pantry. It’s always fabulous. I especially love the two different kinds of sweet potatoes for some reason. I’ve given out the recipe multiple times. It’s that yummy. Thank you!!! Excellent recipe! 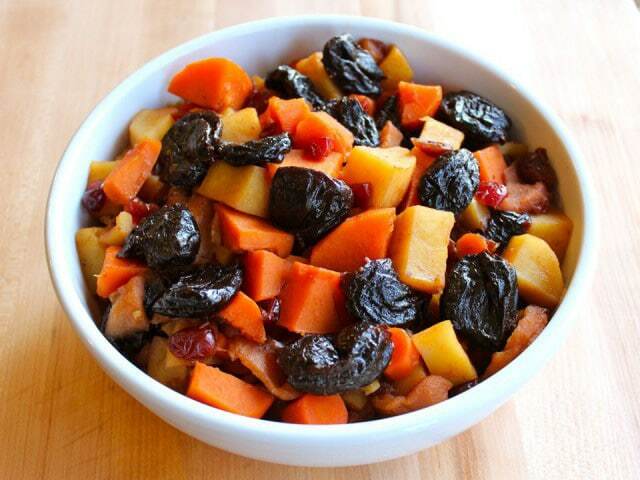 I added dried apricots and substituted raisins for cranberries. 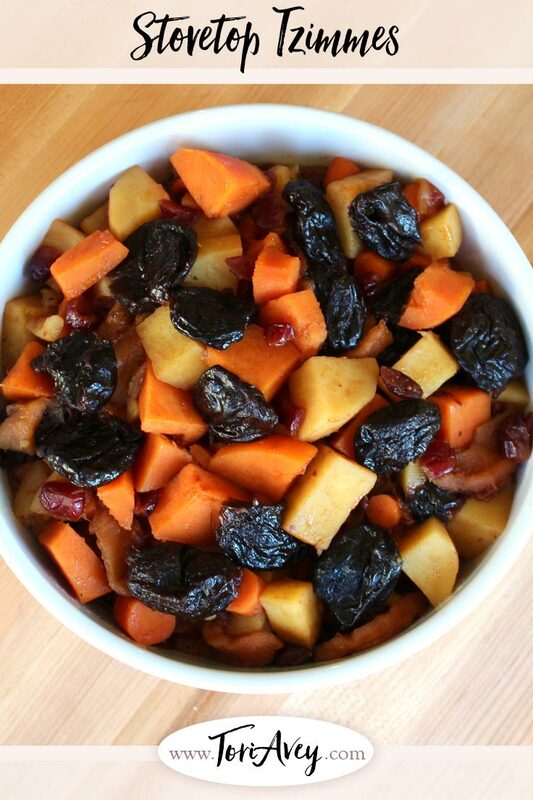 Since I didn’t have a lot of time, I also substituted to large cans of yams for the potatoes and threw them in with the raisins and prunes towards the end. This recipe was excellent! 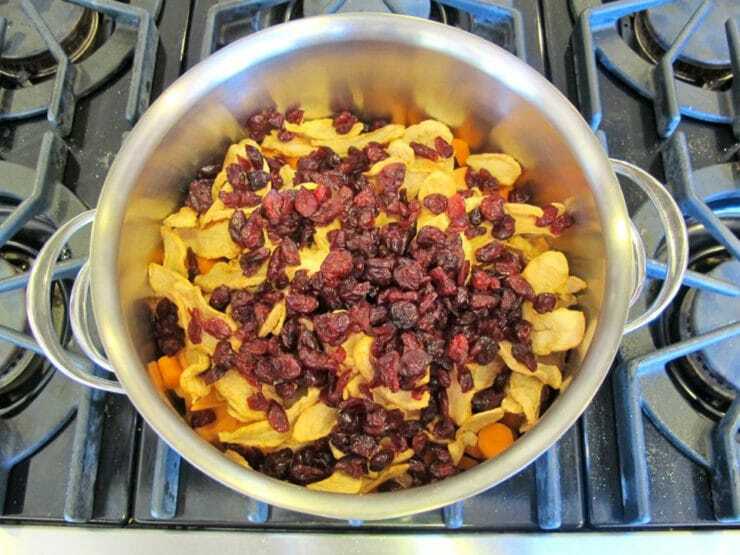 I added dried apricots and subsituted raisins for cranberries. It would not be a holiday in my house without this recipe. I always cook the day before and under cook by about ten minutes. I don’t add the prunes until the day of. Thank you for this recipe. How do you store it if you cook it a day ahead? Refrigerator? Room temperature? This will be my third year adapting this recipe for my family! I have made a number of changes to accommodate dietary restrictions and preferences and it’s a great template. I sub dried apricots for the apples and cranberries as well as pineapple juice for orange juice. I am going to try it without added sugar this year, per another reviewer’s idea. Making this for 75 people next week for Passover. My mom used to use canned Yams. Is this OK? 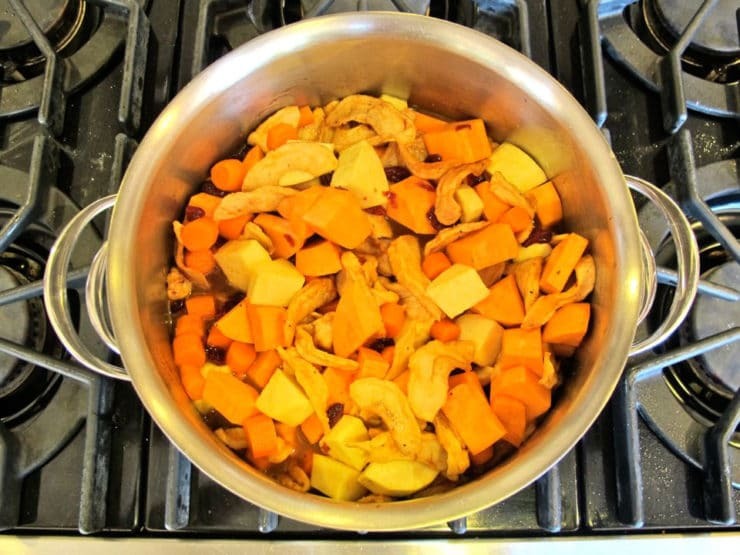 Hi Lisa– canned yams will be too soft and mushy, unless you plan to add them right at the end of cooking. I used less than honey specified and no brown sugar, plenty sweet. Also I think I was very close on her measurements – we had 6 adults & 5 kids, I had 1/2 leftover. Actually nothing compelling about this recipe. Needs some zingy- ness – maybe grated orange zest? Just made this slightly underdone as you suggested (40 min first and then 10 after prunes) as it will be re-heated to be served tomorrow for the holiday. Am bringing it from Maryland in a cooler on the train, for my 92 year old Jewish mother in NYC! I must admit, I took a taste and it is PERFECT! (I did add 1/2 of a large onion sauteed in a little olive oil for a touch of savory, but other than that stuck to the recipe by the letter. GREAT recipe and great site! (Love your falafel as well!). Thank you! I’ll be back looking for other goodies! Hi Tori, Thanks so much for this wonderful recipe. I am going to make it for Passover. My son is vegan and doesn’t eat honey, What should I do? Thanks. Susan, you can use agave nectar. not sure if it had been emntioned but another alternative would be to use vegetable stock inplace of the chicken or salted water. I am so excited to try this recipie for rosh hashana. If I omit the prunes, will that change the dish drastically? Also, is it possible to freeze it? Thanks! I am a big fan! Perel it is great without the prunes too. I’ve never frozen this one, I’m afraid reheating might make it mushy… I could be wrong though! Hi Tori! Can I make this in the morning without the prunes and just reheat it? Hi Dana, yes you can. You may not want to cook it for the whole time (perhaps stop 10 minutes before the end of cooking) and when you reheat, finish cooking. That way it won’t turn mushy when you reheat. Enjoy! HI there Tori, can this recipe be made in a slow cooker and if so how long to cook it on low? Thank you it sounds wonderful! Hi Tori, it looks delicious! Can I substitute white sweet potato with butternut squash? Also can I omit sugar since our family is on a healthy diet? Shana Tova! Thank you so much! Rachel yes to both questions. Enjoy! Love this dish!! It’s easy to make and it’s delicious. This will be my 3rd or 4th Passover making this dish. It wouldn’t be a proper Seder without it. Thanks. I am preparing this dish for 9 adults and 9 kids for Erev Yom Kippur. Have you ever doubled it? If yes, did it still turn out OK? Any suggestions? Hi Marlo, I haven’t ever doubled it. The only problem I foresee is it being difficult to stir in one large pot… there are a lot of chunks, and the more you stir/agitate the more likely they are to fall apart. No big deal if they do flavor-wise, but they won’t look as nice. You might want to try making the two batches in separate pots, it might be easier to manage. Enjoy! I’ve tried over the years to reproduce my grandmothers tzimmes. Finally I think I found the recipe here! I never understood what the symbolism was aside from being sweet for a sweet new year (traditionally served on Rosh Hashanah – the Jewish new year). I finally found out, and the symbolism may change the way you cut your veggies! The sweet potatoes and carrots represent golden coins so cut your veggies in rounds. My grandmother did this, as her mother did, as her mother did … Who knows if any of them knew the reason. This dish represents a blessing for a sweet and prosperous new year! This was a delicious and easy tzimmes to make. Finding white sweet potatoes was the only slight hitch. I went to the Asian grocer and they carried a white fleshed yam from Japan that did the trick. I found that the liquids were better absorbed the second day after cooking. This was great for Rosh Hashana and I will be making it for Pesach as well. Great sub on the white Japanese yam Phyllis! You could also use a Yukon Gold potato for a more savory tzimmes, or just sub more orange yams if you like. So happy you liked it! Outstanding dish! I made it parve, added a dash of cumin to contrast with the sweetness. 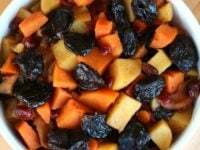 Also, used whatever I had at home: dried apricots, raisins, and prunes along with the carrots and sweet potatoes, no white potatoes. My Yiddishe mamaleh (for real…a survivor from Poylin whose first language was Yiddish) couldn’t get enough. Really delish and a great Rosh Hashana treat. Thank you, Tori, and Shana Tovah! Fantastic Malka! Makes my heart happy to know that your Yiddishe mamaleh liked it too! Only problem is I may have added too much liquid and now I am not sure what to do… drain the excess? Any tips? Oh goodness, I’m probably too late to help here… I would have drained the excess. Hopefully you were able to figure it out! I am making this right now for the holiday. My house smells “delicious”. I am also making 2 sweet kugels, 1 gluten free and 1 with egg noodles. this looks delish ( as does everything on your site) – can i make it a day in advance and if so would i reheat it on top of the stove or cover it and heat in the oven ? If making it a day in advance, I would leave out the prunes when you first cook it. Then, the next day, toss the veggies with the prunes and reheat everything on the stovetop with a little broth in the bottom of the pan (maybe 1/2 inch) till the veggies are warmed through and the prunes are softened. Of course, if you prefer the prunes to be cooked down to a mush and make a sort of “prune sauce,” you can cook the prunes in advance too… it just won’t look quite as nice as the picture, since they get soft quite easily. We are running a Passover at our Church this Saturday and I going to make this yummy looking Tzimmes for 100 people! I have bought carrots & orange sweet potato as the root crops as I don’t think we have yam down here in Australia (well not readily available). I was going to make 4 pots of double quantity and I think that will be enough as there is lots of children who won’t eat much. Will it work making double quantity in a pot or will I run the risk of the bottom catching or vegies not being cooked through? Or should it work the same? Hope you can help!! Also I made 270 or your Matzo balls (just mini size though) and attempting 25L of your Chicken soup tomorrow!!! With all your positive reviews I’m counting on a good outcome. Thanks for your blog. The step by step photos really help! Orange sweet potatoes are known as yams in the U.S., so you’re fine there. A double quantity should be fine, just make sure to keep the heat moderate/low and check often to make sure no burning or drying occurs. That’s a big job, best of luck with it! I’m making this dish for a late Pesach seder. I’m a bit confused, though. What does “covering the vegetables halfway” mean? How is something half covered by liquid? Is that like being half-way pregnant? 🙂 Thanks. It means to cover the vegetables with liquid till it reaches halfway up the sides… So, if the vegetables are 6 inches deep in the pot, cover them with 3 inches deep of liquid. Hope that makes sense! I’d like to make this in advance to serve on Passover. Can it be cooked and then frozen? Hi Alice, I think this will probably freeze well. Just know that the prunes will likely dissolve after freezing, then reheating. They are already quite soft, which is fine… when they dissolve it makes a sort of rich, sweet sauce. Hope that helps! question: do you think this is possible done in the oven? Really prefer yams that are baked, not boiled. So much sweeter. If so, what temp? 325???? Can this recipe be made in advance and then reheated in the oven or on the stove? Will it get dried out if I do this? Thank you for all your help and have a very happy, healthy holiday! 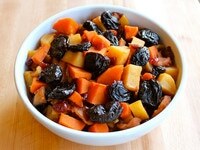 Donna- I do this recipe w/o the prunes and reheating it has not been a problem. However, the original recipe warns against over cooking the prunes and turning them to goop. Tzimmes more liquidy so I guess I got to allow those prunes to cook a little longer. Anyways watch my family’s movie it’s called Defiance its about the Bielskis who saved Jews during WWII, take note of Zus, my father. I ran a Yom Hashoah program 2 years ago and our speaker was Anna Monka..she was one of the women who lived in the forest and was alive because of the Bielski brothers..what a wonderful, brave and resourceful family. Many thanks to them for all the lives saved because of them.. Missed the prunes, ran short of honey and tossed in a little chicken – what a superb dish this is. I think it will become a regular at our thanksgiving meal (and possibly church potlucks)! Please take a bow oh Shiksa! Can you mix the Chicken Broth with the other ingredients at the same time? sounds delicious! do you have a recipe? I have been making Tzimmis for over 50 years..It is an enhanced recipe my mother made..I do not use any liquid..the veggies take care of that…I use sweet potatoes, carrots, short ribs, chichen wings, brown sugar, honey and maple syrup..it is good for a side dish and a main meal..it is a family favorite.. The recipe I’ve always made uses a a can of pineapple chunks. Enjoy. Looks Heavenly, I am going to try that this weekend! Thanks! I made this for RH company – and it was a huge hit! It is the BEST tzimmes I’ve ever made, worth the work of cutting everything up. My husband loved it, & I will definitely make it again. Happy you enjoyed it Amy! I made this and it was delicious! I wasn’t sure what white sweet potatoes were so I used Yukon Gold and it worked well. I will make again! This looks delicious, Tori. I suspect with flavor party going on – it would be okay to omit the cinnamon. What a beautiful dish – and I know what you mean about precious oven space. I use two electric roasters during Thanksgiving so I have room! I adore your blog/website. A friend introduced me to it last year and I’ve been coming back regularly ever since. Many thanks for the wonderful ideas as well as the great recipes, clear instructions and photos. Makes for a wonderfully enticing and informative resource. Kudos! I love your site. Shulie Foodwanderings turned me on to it. Your Tzimes looks wonderful and I will try it. I still use a little chicken fat for holidays. Oye….I know. Again, wonderful food and wonderful web site. L’Shanna Tova. Good for you Diane! Chicken fat = liquid gold. Why not splurge during the holidays? 😉 Shulie is so great! This looks so tasty. It has so many different flavors in there. I’ve never heard of tzimmes. I am in love with your blog and just subscribed! I found you over at Erika’s kitchen…so glad I stopped by! This looks delicious and I am thinking of adding it to our meal on Wednesday. Is there another fruit that can be used instead of Prunes? I am not normally fussy but Prunes just don’t thrill me and I don’t think they will thrill the family. Thanks and so nice to meet you! Since we are now gluten free in my home, this dish will be a wonderful compliment to our holiday menu. l’Shana Tova! So, there is no broth to this dish, or very little? This looks amazing and I will have to try it for sure. Since the dish is so sweet, it looks like a good side dish for Thanksgiving as well. Now this is one I had not heard of before. What a great combination of flavors and I like the use of chicken broth. Delicious! This looks like a much nicer version than the overcooked meat version of Tzimmes my Bubbe made…not ever a favorite of mine. Yours looks wonderful…the colors bright and beautiful. Great pics! I would love a bite right now!